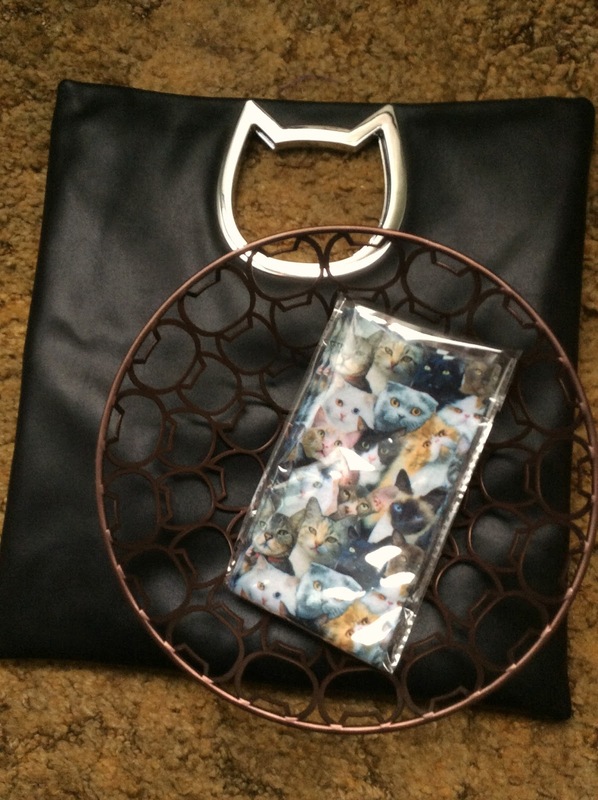 The theme of November's CatLadyBox was "The Cat Lady Collection"...this is what was inside! 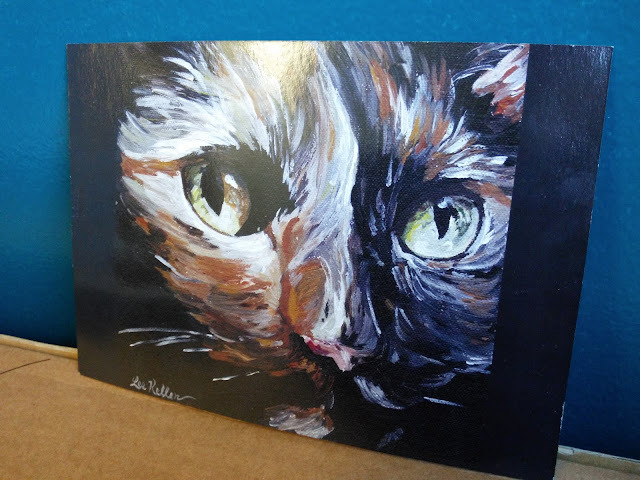 Featured Cat Lady Artist Lee H. Keller: It will probably come as no surprise to anyone when I say that when I removed this card from the box I gasped out loud. TORTIE ART!!! I just found out it's available as a larger print on the artist's Etsy shop which you can be sure I'll be ordering! Cat Cutout Convertible Tote & Clutch Bag: This bag is pawsitively divine. It can be used as either a shoulder bag by attaching the included strap or as a clutch purse. I will be toting it to all my holiday activities this year! It's incredibly soft and versatile. Decorative Wire Bowl: Too cute for words. I haven't decided yet if I'm going to use it in the kitchen to hold fruit, the living room to hold various odds and ends, or I may just hang it on the wall as a decoration. Purrfect Pinecone & Argyle Pumpkin Catnip Toys: Mudpie is crazy over her little purple pumpkin! Wow, what a super cool box this month! We love unboxings! The cat cut out tote is totally amazing! The tortie print would be my favorite, too. I just love seeing all of the lovely things the CatLadyBoxes contain. Nothing beats tortie art, that's for sure! THat was a great box of goodies this month. I love the tortie art. A box full of all kinds of kitty goodness! I especially love the clutch purse and the tortie print. I love the art and the purse!! That's a gorgeous painting! Wow! Wow! This was a great box!! That looks like a fabulous box!! Love the painting!